Ophelia has been confidently walking and running (running mostly) for a while now, so we thought it was time to get her some sort of bike. 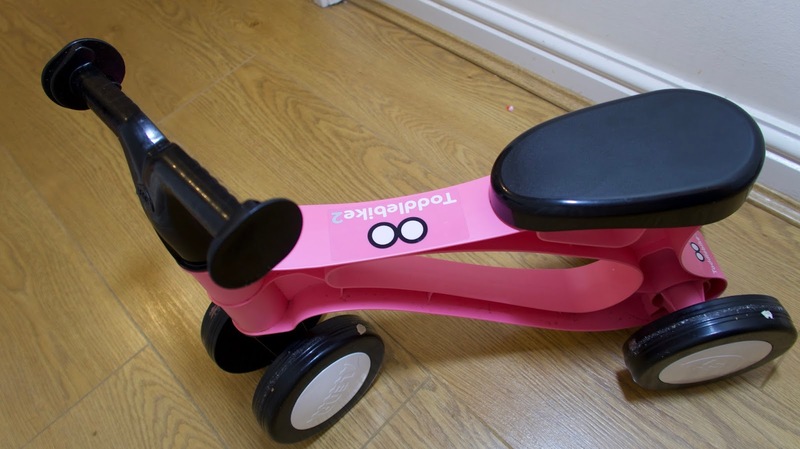 After much research and asking friends, we were recommended a Toddlebike. This was not something hubby and I had heard of before. With Eva, she went straight to a normal bike and she still struggles riding it, even now. She's not very confident on it at all. 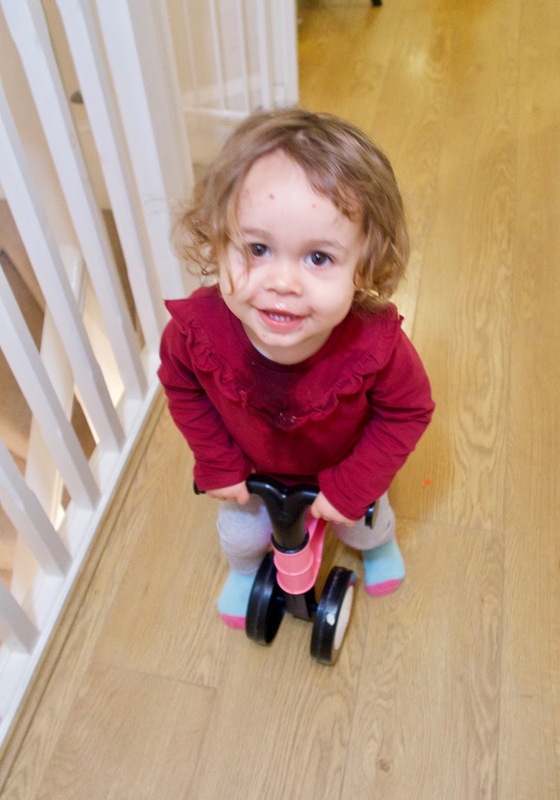 As luck would have it, we were asked if Ophelia would like to try out the Toddlebike2 so we jumped at the chance. We chose to receive a pink one but it also comes in blue and red. When it arrived, I thought we'd been sent an empty box. Normally when we get a parcel, I end up asking the poor postman to bring it into the house but this time when he handed it over, I was rather perplexed. You hear the word bike and automatically assume it'll be heavy but this one is honestly as light as a feather. Even Ophelia can pick it up. It actually weighs less than 1kg. It also arrives fully assembled!! Anyone that has had to put together a bike or any children's toy will know just how frustrating that can be so this was fab to see. 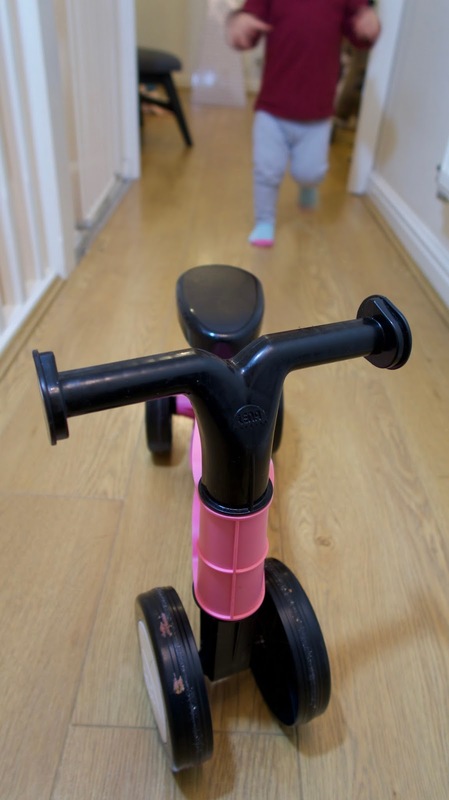 The bike is designed for children who are confident in walking so around the age of 18 months old, until they are ready for a big bike.The Toddlebike helps improve little one's confidence in their balance which will then help then in the future when it comes to learning to ride an actual bike. Whenever Ophelia isn't riding it around, Eva is on it. Luckily it has been tested up to 100kg so older siblings are fine to test it out, just prepare yourself for the arguments. The girls always end up fighting when the other one has it but that's typical sibling rivalry at its best. 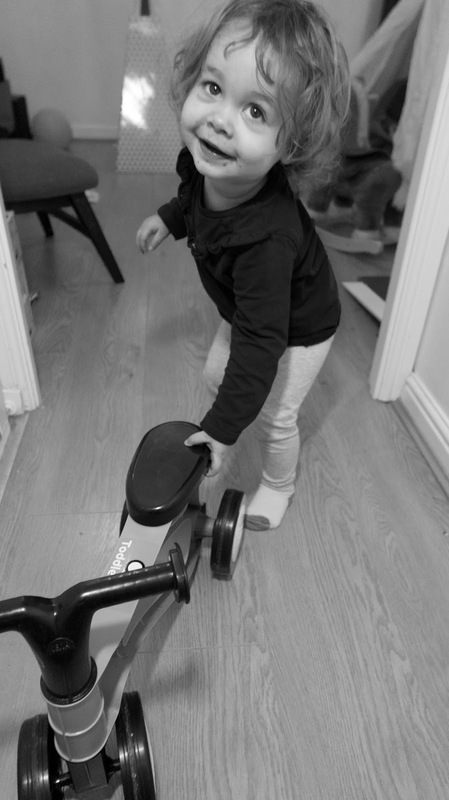 Ophelia took to the Toddlebike straight away. Some children need a bit of practice but others will be just like Ophelia. The minute she sat on it she knew what to do. She whizzes around the house thinking she's the bee's knees. The handle bars and seat aren't adjustable but they are within easy reach. My favourite feature is definitely how light it is. The bike has come around everywhere with us. It goes on the school run (such a godsend as it gets Ophelia and me, there and back quicker). It has been to the beach with us and it has also been on our recent caravan holiday. It's small enough to pop in the car and not take up too much room. 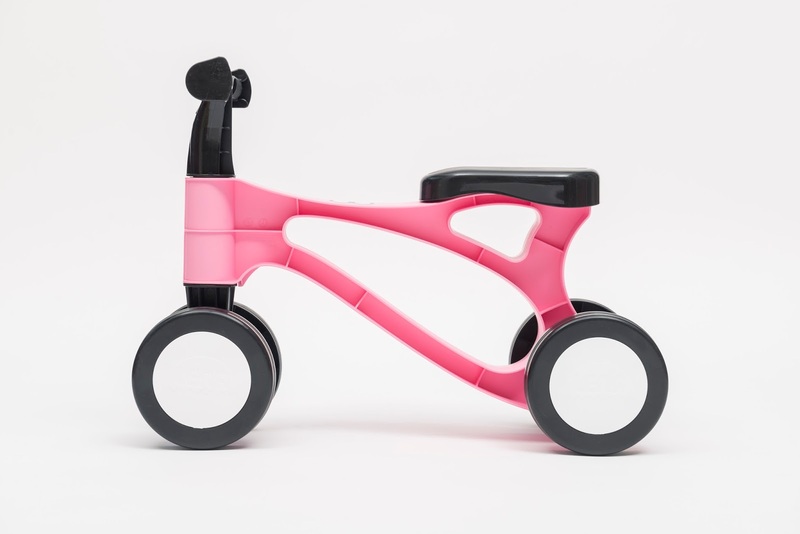 You can even pop it on your stroller or in the basket. We also regularly take it to grandparent's houses to keep Ophelia entertained. The bike can even go through water which is great fun for kiddies that love puddles. It is water and rust proof and therefore all weather fun. Ophelia loves everything about this bike. It's honestly one of the best things we've got for her in a long time. 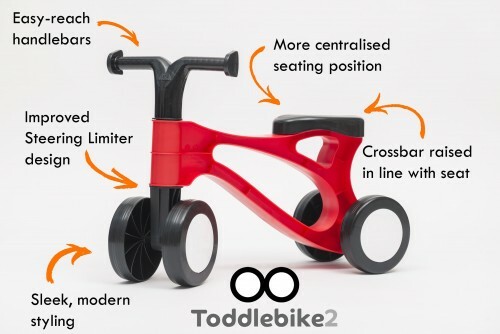 You can purchase the Toddlebike2 for £23.95 here, http://www.toddlebike.co.uk/shop but I have a 10% discount code you can use to help with your Christmas shopping. Simply add BLOG17 for your discount.